The station, which broadcasts on 89.7 FM, is owned by Lansing Community College in Lansing, Michigan. The station began broadcasting in 1994 with 100 watts. Power was increased to the present 420 watts in 2001. WLNZ began broadcasting in HD in 2006. Programming is mostly jazz, blues and acoustic music. Each morning there is a live local talk show called Coffee Break which is televised in the Lansing area on Comcast local access. 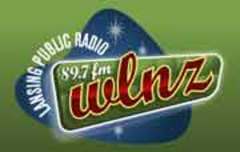 WLNZ also has an Internet-only student station called WLNZ-2, which plays rock music from the '90s.